New Speakers release in HK autumn fair 2015. Welcome to visit us! As one of rare companies in China that is able to massively produce WiFi speakers, Jaocom Audio will release our revolutionary WiFi & Bluetooth 2-In-1 Speaker and other new products of WiFi hypermedia Android system sound bar, the most cost effective bluetooth tower speaker, bluetooth desktop speaker, Bluetooth portable speaker, Bluetooth sound bar with karaoke etc. in autumn 2015 at HKCEC. 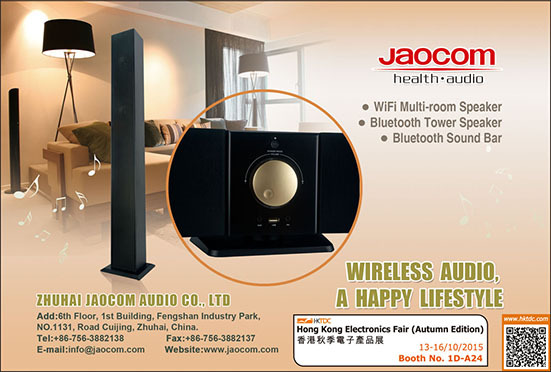 Jaocom will strive to exhibit the the best buys for wireless speakers in fair and rank our brand in China top supplier list for Jaocom ideal of “democratize HiFi speakers to the masses” come ture early.